Join us for our Key West Valentine’s Day Sail aboard the Schooner America 2.0! This is a day to celebrate your loved one. So spend Valentine’s Day in Key West aboard our elegant Schooner. It truly is the perfect way to show your love and appreciation. 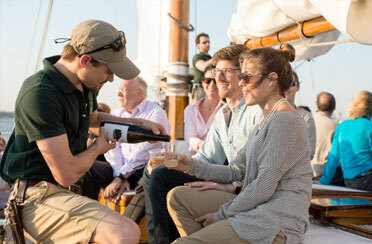 Sail through Key West with a glass of Champagne in hand and cruise aboard our classic boat for an evening of elegance. Watch the sun dip beyond the horizon. Snuggle up with your loved one to celebrate your love for each other. Reflect on your relationship aboard this Valentine’s Day cruise. Our professional and hospitable crew will cater to your every need. We will wine and dine you and make you feel like royalty. Key West sailing is a magical way to capture a moment in time. So what better cruise to do this on then the Key West Valentine’s Day Sail. This magical Key West sunset sail will take your breath away and your loved one will be swept off their feet all over again.